Jimmy Hayes is about to live out his childhood dreams by taking the ice as a member of the Boston Bruins. 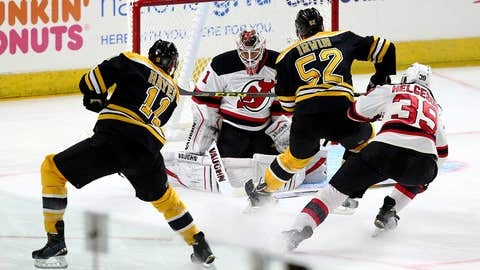 When Jimmy Hayes was traded from Florida to Boston over the summer, there was a good reason for Hayes to be excited about the destination: Hayes grew up in Boston and even stayed in the city to play his college hockey as he spent three seasons with the Boston College Eagles. The trade made for a summer of anticipation for Hayes before he could finally make his regular season debut with his hometown team. Now that the season is about to begin, Hayes is clearly antsy to get out on the ice. Hayes projects to play a secondary role with the Bruins as a third-line winger. The 25-year-old provided strong supplementary scoring for the Panthers last season with 35 points (19 goals, 16 assists) in 72 games. At 6-foot-5 and 215 pounds, Hayes also provides the Bruins with a solid physical presence within their offensive corps.